MCD x FSG Originals, 9780374535803, 416pp. Early on July 16, 1945, Joshua Wheeler’s great grandfather awoke to a flash, and then a long rumble: the world’s first atomic blast filled the horizon north of his ranch in Alamogordo, New Mexico. Out on the range, the cattle had been bleached white by the fallout. Acid West, Wheeler’s stunning debut collection of essays, is full of these mutated cows: vestiges of the Old West that have been transformed, suddenly and irrevocably, by innovation. Traversing the New Mexico landscape his family has called home for seven generations, Wheeler excavates and reexamines these oddities, assembling a cabinet of narrative curiosities: a man who steps from the stratosphere and free-falls to the desert; a treasure hunt for buried Atari video games; a village plagued by the legacy of atomic testing; a lonely desert spaceport; a UFO festival during the paranoid Summer of Snowden. The radical evolution of American identity, from cowboys to drone warriors to space explorers, is a story rooted in southern New Mexico. Acid West illuminates this history, clawing at the bounds of genre to reveal a place that is, for better or worse, home. 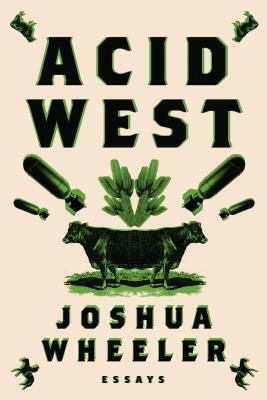 By turns intimate, absurd, and frightening, Acid West is an enlightening deep-dive into a prophetic desert at the bottom of America. Joshua Wheeler is from Alamogordo, New Mexico. His essays have appeared in many literary journals, including The Iowa Review, Sonora Review, PANK, and The Missouri Review. He’s written feature stories for BuzzFeed and Harper’s Magazine online and is a coeditor of the anthology We Might as Well Call It the Lyric Essay. He is a graduate of the University of Southern California, New Mexico State University, and has an MFA in nonfiction writing from the University of Iowa. He teaches creative writing at Louisiana State University.